A fishing trip to the Abrolhos Islands, Western Australia will leave memories that last a lifetime. Blue Juice Charters take great pleasure in taking new and repeat customers on Abrolhos Island Fishing charters to this outstanding location for 3 to 5 days of mind-blowing fishing action. Abrolhos Islands Fishing Charter from $1,350.00 per person. 3-days, 4-days and 5-days options available. For bookings and details of our Abrolhos Island Fishing Charter, contact Blue Juice Charters today. The Abrolhos islands are located just 3 hours off the coast of Geraldton, the 122 islands that make up the magnificent Abrolhos stretch out over 100km of water. The northwestern and southern currents converge through the islands making the area a unique and amazing place to fish a wide variety of species; Big Fish and lots of them. Once you step on our boat Bluewater for your trip to the islands you can forget about the hassles of life for a few days. 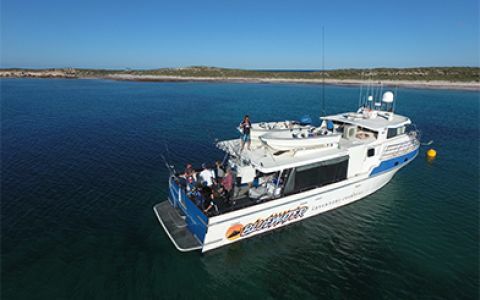 Unlike other charters where you’re expected to pitch in, everything on your fishing trip with Blue Juice Charters is taken care of, giving you, the best liveaboard fishing experience at the Abrolhos Islands. All meals are provided and your fish are cleaned, filleted, packed and frozen ready for you to take home. Accommodation is below the deck in bunk style air-conditioned comfort, or ask one of our friendly staff to set up a camp bed on the deck so you can sleep under the Abrolhos stars. Favourites like Snapper, Dhu fish, Queen Snapper, Breaksea Cod are high on the list and more as they gather on the outer reefs. The Blue Juice crew are the best- hand selected individuals who are passionate about fishing and people. 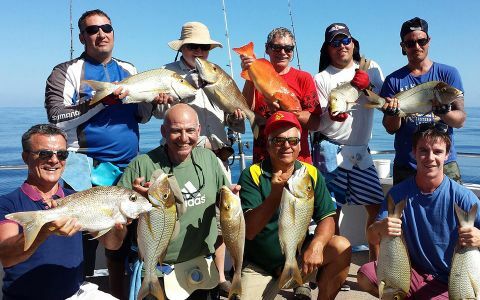 We aim to give you a great day of fishing in the deep Perth waters. Our aim is to make your Abrolhos Island Fishing trip one to remember for years to come.